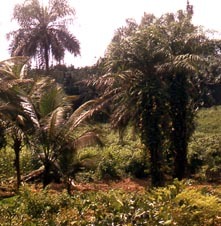 In the rain forests of West Africa, the abe (oil palm) is ubiquitous. Much like the cedar tree for First Nations people of the West Coast of Canada, it has many uses, and is made into many things. This is a set of illustrations to demonstrate some of those things. 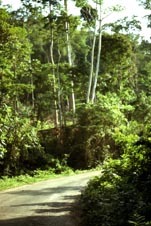 The Rain Forest; On the Kwawu Escarpment. In my Three Souls paper, I talked about red being associated with women's things, and white associated with men's things. So, too, with the abe. 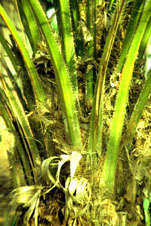 Some things about it may be neutral (eg baskets), but the two major products from it, the oil from its kernels (red, female) and the sap from its trunk (white, male), are clearly set in the colour cosmography. Let us look. This paper got too long, so I have split it into several portions: on farming and oil extraction, on tapping palm wine, on marketing palm wine, and other products of the oil palm tree. Click on the picture below to go to each of those. I hope that you enjoy these pictures and the text. These are personal, not commercial slides. Please do not steal them, or, if you use them, ask first and then inform me.